In November of 2009, WRDW-TV partnered with WBBQ radio to give away a trip to Los Angeles to see the Ellen Degeneres Show recorded live. I created the logo, incorporating the Ellen logo, and put together some web banners to advertise the contest. 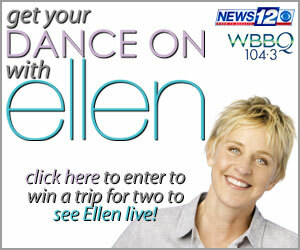 300×80 promotional tile linking to the Get Your Dance On with Ellen contest. 300×250 promotional ad for the Get Your Dance On with Ellen contest.